Harnessing the healing power of plants is a sacred and ancient art—yet many modern plant-based medicinals are made with industrially farmed ingredients that have traveled far from their roots. Lauren, a wonderfully practical human/herbalist, started Wooden Spoon Herbs to bring the generations-deep tradition of biodiverse healing native to southern Appalachia back to our shared communities. Based in a cabin in North Georgia, this small-batch herbal apothecary only uses thoughtfully gathered, American-grown herbs and botanicals—either lovingly hand-picked, wild-foraged, or locally sourced from small family-run medicinal herb farms. The resulting tinctures, salves, elixirs and creams are, truly, the best kind of medicine. This delicious minty tea is perfect for the end of a long day. Fill your cup to the brim with it’s calming vibes. Oats, tulsi, peppermint and passionflower make a beautiful combination of nervines to soothe frazzled nerves and take the edge off in the gentlest way. 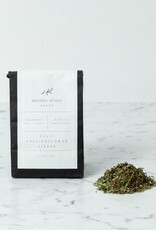 * Tulsi is a species of basil, a bit more musky and spicy than the kitchen variety. It maintains optimal cortisol levels in the body, supports the nervous system, and promotes grace and ease. 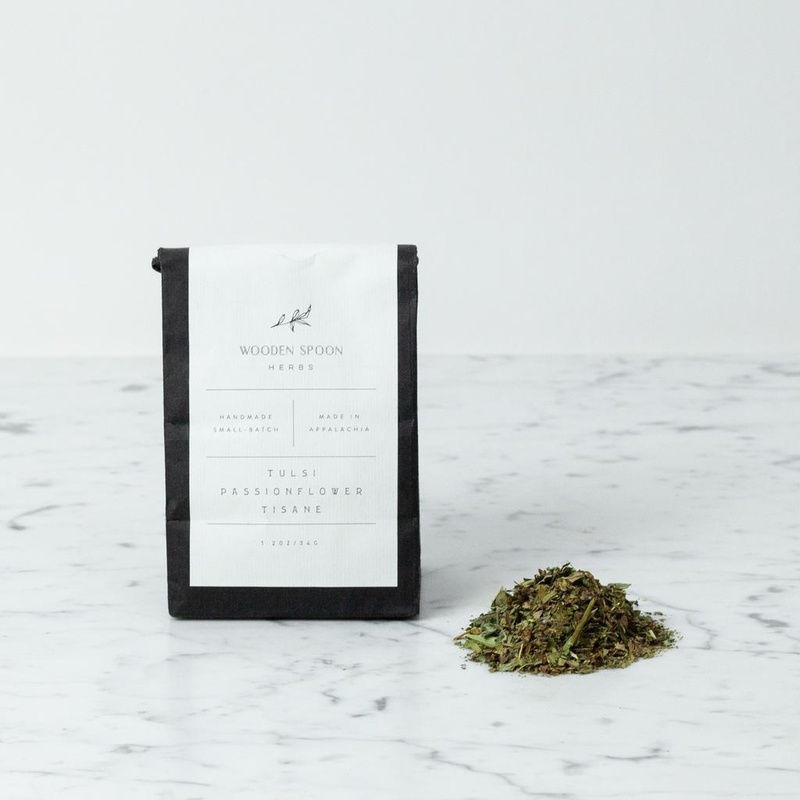 Our tulsi comes from a small farm in Vermont. Milky oats are the unripe seedpod of the oat plant. Yep, the same plant that gives us oatmeal gives our nervous system a deep watering when the metaphorical soil is too dry. Milky oats calm by nourishing, and they are great for both acute and everyday use. Our oats come from a certified organic farm in North Carolina. Ingredients: tulsi*, peppermint*, milky oats*, passionflower* (*certified organic) To use: steep 2 teaspoons in 8 ounces of hot water for at least 10 minutes. 1.2 oz / 34 g *These statements have not been evaluated by the FDA. This product does not intend to treat, diagnose, cure, or prevent any disease. If you’re pregnant, breastfeeding, or on any medications, please consult with a qualified health professional before beginning any new herbal products.